I can't be sure, but it appears to be cut out of the front panel of a typographical DJ, rather a catalog. 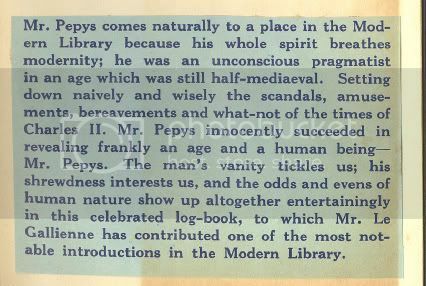 Well, I found a BL type 2 binding Diary of Pepys at a local thrift (paid $1) and glued inside are several newspaper clippings related to Pepys, illustrations, etc., a nice bookplate. Also, is a piece of blue paper talking about Pepys Diary and the ML. Sounds like a dj blurb. It is only printed on one side and measures approx. 3.5" x 2.25". The scan is spot on for color, light blue paper with dark blue text. What is this from? Part of the elusive "b" dj for this title? An entry on this title from a catalog?